The 2013 Saravan earthquake occurred with a moment magnitude of 7.7 at 15:14 pm IRDT (UTC+4:30) on 16 April. The shock struck a mountainous area between the cities of Saravan and Khash in Sistan and Baluchestan Province, Iran, close to the border with Pakistan, with a duration of about 25 seconds. The earthquake occurred at an intermediate depth in the Arabian plate lithosphere, near the boundary between the subducting Arabian Plate and the overriding Eurasian Plate at a depth of about 80 km. It was the largest earthquake in Iran within the last 40 years, equal in magnitude to the one that shook Tabas in 1978 killing 15,000, and possibly the largest in the last half-century. The earthquake followed a magnitude 6.3 event near Bushehr. The town of Mashkel was close to the quake's epicentre, and around 85 percent of the city's buildings were demolished. Thirty-five people were killed in the earthquake. The earthquake struck 83 kilometres (52 mi) east of the city of Saravan, Iran, and was felt throughout much of eastern Iran and southern Pakistan, and as far away as Riyadh, Manama, Doha, Abu Dhabi, Muscat, and Delhi. Initial sources cited that close to 100 people lost their lives in Iran and that Iran had confirmed the deaths of 40, but these sources have been disputed; Iran has since officially denied death counts, only reporting injuries, as of 14:00 UTC. Although the earthquake was much stronger than previous ones in the area, the depth and the terrain/population density above the focus, as well as predominating building construction being relatively light materials such as mud and wood, meant that there were relatively few casualties in Iran, although the number of casualties was higher in the neighbouring state of Pakistan, with at least 34 reported deaths. According to the Iranian Red Crescent, all communications in the area have been cut, and rescue teams have been dispatched. Buildings were evacuated as far away as Delhi and on the Arabian Peninsula, and many buildings in Iran were completely destroyed. The quake reportedly occurred within the subducting Arabian Plate below the overriding Eurasian Plate. The Strait of Hormuz separates two forms of plate collision. To the northwest, continental crust portions of the Arabian and Eurasian Plates are colliding, resulting in compressive faulting. To the southeast, dense oceanic crust of the Arabian Plate is subducting underneath the Eurasian Plate at the Makran Trench. 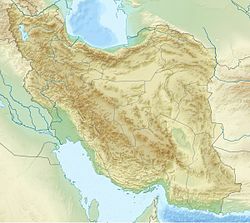 Iran lies on the fault line between the Arabian plate and the Eurasian plate. The collision of these two plates cause most of the earthquakes that strike Iran. The specific area of the fault that lies below the Sistan and Baluchestan Province is referred to as the Makran region. In this area the Arabian Plate is folding under, or subducting, the Eurasia Plate. There has been an increase in earthquake activity in not only Iran but also neighboring Pakistan. In the entire 20th century Pakistan and Iran experienced a combined total of twenty-six earthquakes. Within the first thirteen years of the 21st century Pakistan and Iran have suffered a combined total of eighteen earthquakes, with the most recent earthquake in Iran occurring on April 16, 2013 and the most recent earthquake in Pakistan occurring on September 28, 2013. These earthquakes can range from microearthquakes, measuring less than a 2.0 on the moment magnitude scale (Mw ), to very large events measuring 7.0–7.9 Mw . The smallest earthquakes may not be felt, while major earthquakes can be assessed at VIII (Severe) or higher on the Mercalli intensity scale. Subduction usually occurs at convergent fault lines. The underlying tectonic plate descends, or subducts, into the Earth's mantle. Earthquakes occurring at these faults are very large in magnitude and scale. 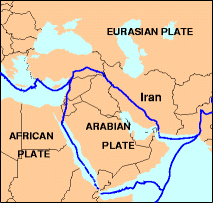 In this case the disappearing Arabian plate is part of the oceanic crust while the Eurasia plate is part of the continental crust. The Makran Region Of Pakistan and Iran is characterized by three mountain ranges. These mountain ranges, the Makran Coastal Range, the Central Makran Range, and the Siahan Range, are located in the southwestern area of the Baluchestan province of Pakistan. These ranges are the product of years of collision between the Indian Plate and the Eurasia tectonic plate. The Makran Region is also the covering point of three tectonic plates. The Indian plate, Eurasia plate, and the Arabian plate meet and converge in this area. There is no method to accurately predict an earthquake, however, there are systems which attempt to give early warnings when earthquakes occur. Currently the most all-inclusive system is Japan's Earthquake Early Warning system. This system is monitored by the Japanese Meteorological Agency The JMA sends out the warnings through the television, mobile devices, the internet, and the radio as soon as an earthquake is detected. Other countries have similar systems that are mostly limited to a particular region, for example, the United States' early warning system is in place only for the earthquake disposed west coast. One study conducted in California, United States suggests there may be a new way to more precisely presage earthquakes. This group of scientists, composed of scientists form the Carnegie Institution for Science Rice University,and the University of California, Berkeley monitored earthquake waves in the San Andreas Fault using seismometers for twenty years. This group discovered cracks in the fault filled with fluids. The scientists noticed that these fluids shifted after being disrupted by seismic activity. Shifting fluids cause faults to weaken, making them more prone to earthquakes. The International Federation of the Red Cross and the Red Crescent Societies is a nongovernmental organization founded at the 1919 Paris Peace Conference after World War I. The IFRC has seven fundamental principles. These principles include ensuring respect for all humans, making no discrimination as to nationality, religious beliefs, or political opinion, and remaining neutral in times of controversy. The IFRC also has a set of goals it aspires to achieve during each disaster recovery. These four goals are: reducing the deaths, injuries, and impact caused by the disaster; decreasing the amount of death and illnesses caused by diseases and public health emergencies; increasing its ability to address the urgent situations; and promote respect for human dignity while reducing intolerance and discrimination. The IFRC has created stock procedure for disaster relief, however the specifics vary based on the type of disaster, the region the disaster affected, and the amount of destruction caused by the disaster. On April 9, 2013, the IFRC deployed seventy-five rescue teams to northwestern Iran following a 6.3 magnitude earthquake. The next day over 800 volunteers were in the disaster area helping those affected. A week later a 7.8 magnitude earthquake struck southeastern Iran, the IFRC dispatched air assessment teams in addition to forty ambulances. While the first earthquake was much more destructive, the IFRC was still able to aid both disaster areas. In June 2013, the IFRC and the Red Crescent Society of the Islamic Republic of Iran agreed to band together in an attempt to redouble their efforts to promote better building codes in disaster prone areas, like Iran. These two groups will also work together to strethen each group's capacity to respond to disasters. Their goals include erecting resilient buildings, improving disaster preparedness, and further developing the IFRC's disaster response guiltiness. There may be similar partnerships between the IFRC and other countries to achieve similar goals. The afternoon of April 16, 2013 rocked the Sistan and Baluchestan province of Iran and Pakistan. The earthquake, measuring 7.7 on the moment magnitude scale, was not only felt in this southeastern area of Iran and Pakistan but also as far away as India's capital city of Delhi. The rural city of Khash, the closest city to the epicenter, is part of Iran's most impoverished province. Most of the citizens of the Sistan and Baluchestan province live in either mud shacks or tents. The lack of actual structures contributed to the minimal damage which occurred due to this earthquake. Another contributing factor is the depth of the epicenter. The epicenter of this earthquake was located fifty-nine miles beneath the earth's surface causing damage that would normally be found after an earthquake measuring 4.0 magnitude on the Richter magnitude scale. About 127 people were injured, however these injuries were mostly minor broken bones, and the deaths totaled thirty-five people on both the Iranian and Pakistani side of the earthquake. ^ a b "M7.7 - 83km E of Khash, Iran: Tectonic Summary". United States Geological Survey. ^ a b c d e f g h i "BBC News — Major earthquake strikes south-east Iran". BBC News. London: BBC. 2013-04-16. Retrieved 2013-04-17. ^ "Hundreds feared dead in 7.8 Iran earthquake, also felt in New Delhi, Gulf States — RT News". Rt.com. 2013-04-10. Retrieved 2013-04-16. ^ "Reports: Dozens feared dead after strong quake rocks Iran, Pakistan — CNN.com". Edition.cnn.com. 2001-09-11. Retrieved 2013-04-16. ^ "Major quake jolts southeastern Iran — Central & South Asia". Al Jazeera English. 2011-10-04. Retrieved 2013-04-16. ^ "Iran Earthquake | Liveblog live blogging | Reuters.com". Live.reuters.com. 2009-02-09. Retrieved 2013-04-16. ^ "Magnitude 7.5 quake jolts Sistan-Baluchestan in SE Iran, kills 40". 2013-04-16. Archived from the original on 2013-04-19. Retrieved 2013-04-16. ^ "Earthquake flattens Pakistan town". 3 News NZ. April 19, 2013. Archived from the original on September 28, 2013. Retrieved April 19, 2013. ^ "MASSIVE EARTHQUAKE HITS IRAN, TREMORS FELT ACROSS OMAN, REGION". 2013-04-16. Retrieved 2013-04-18. ^ "Tremors create panic in EP, Riyadh". 2013-04-16. Retrieved 2013-04-18. ^ "Major Earthquake strikes India, Pakistan, Iran, Sistan and Baluchestan". Biharprabha News. Retrieved 16 April 2013. ^ "Iran officially denied the 40 deaths today". Earthquake Report. 2013-04-16. Retrieved 16 April 2013. ^ "Hundreds feared killed after strong 7.8-magnitude quake hits Iran". The Globe and Mail. 2013-04-16. Retrieved 2013-04-16. ^ a b c d e Carnegie Institution (1 October 2009). "New Way To Monitor Faults May Help Predict Earthquakes". Science Daily. Retrieved 12 November 2013. ^ a b c d e International Federation of Red Cross and Red Crescent Societies. "International Federation of Red Cross and Red Crescent Societies". International Federation of Red Cross and Red Crescent Societies. Retrieved 14 November 2013. ^ a b c d The International Federation of Red Cross and Red Crescent Societies (16 April 2013). "Massive earthquake strikes in south east Iran". Retrieved 13 November 2013. ^ a b c d The International Federation of Red Cross and Red Crescent Societies (17 June 2013). "Launch of the IFRC and Iranian Red Crescent partnership on urban disaster risk reduction and management". IFRC. Retrieved 14 November 2013. ^ a b Erdbrink, Thomas (16 April 2013). "Powerful Earthquake Strikes in Iran". New York Times. Retrieved 13 November 2013. ^ a b c d e "Major earthquake strikes south-east Iran". BBC News. 16 April 2013. Retrieved 14 November 2013. ^ Karimi, Nasser; Rebecca Santana (17 April 2013). "Iran Earthquake 2013: Large Quake Reportedly Felt Across Middle East Region". Huffington Post. Retrieved 13 November 2013. This page was last edited on 17 April 2019, at 22:01 (UTC).